1. What is your favourite Chopping cover and why? 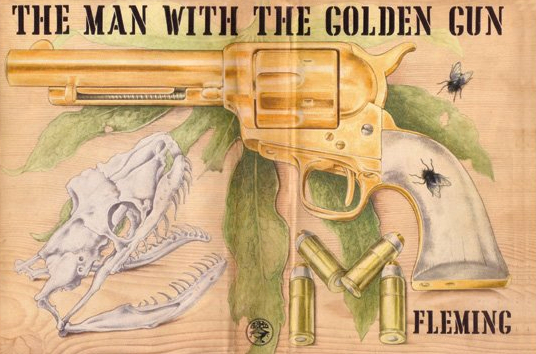 My favourite Richard Chopping cover is “The Man With The Golden Gun” simply because it’s so large it wraps around the entire book. It was also the first Fleming / Jonathan Cape I purchased and looks great. Special mention has to go to “OHMSS” though simply because of the hand shown on the cover. I couldn’t imagine how hard it would have been to draw that hand, to get the proportions, shadows and colours just right to make it appear so realistic it could almost be a photo. Mr Chopping was a great artist. Obviously I’ve concentrated more on collecting paperback covers however I do own a few Jonathan Cape first editions. They’re not brilliant copies or anything but I have firsts from “Thunderball” onwards. My copy of “Casino Royale” is the Pat Marriott dust jacket (right – still a nice cover but no first edition jacket! ), and my copy of “From Russia, With Love” is a FEL dust jacket until I can find an original. Unfortunately the prices of first editions prior to “Thunderball” are a little out of my league. 3. Of your paperback collection, what do you consider to be the ten most collectable covers? 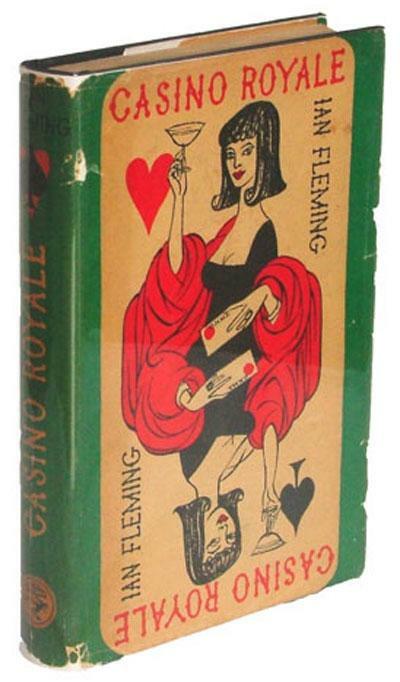 1) “Casino Royale” (334) published by Pan Books in 1955 – (artist Roger Hall). 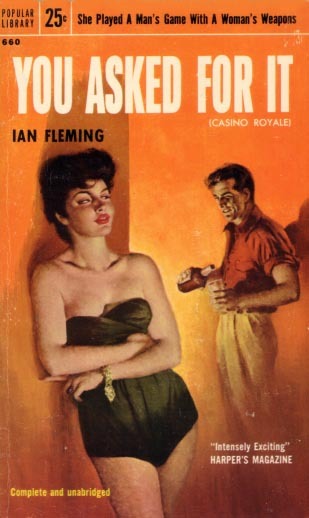 First Bond paperback and first portrayal of Bond on a cover. Often hard to find in great condition. 2) “Moonraker” (392) published by Pan Books in 1956 (artist Josh Kirby). Again an early cover and also difficult to find. 3) “Casino Royale” (G198) published by Great Pan in 1959 – (artist Sam Peffer). Any “Peff” cover belongs in a list of most collectable covers. 4) “You Asked For It” (660) published by Popular Library in 1955 – (artist unknown). Unusual cover, (right) very American and also fairly rare I suppose. 5) “Too Hot To Handle” (M-3070) published by Perma Books in 1957 – (artist unknown). Again another rare cover although I’m not sure the image of a woman being held by the throat indicates this is a spy novel. 6) “Thunderball” (X201) published by Pan Books in – (artist Raymond Hawkey). Love those bullet holes. Inspired the first full series of Fleming Bond covers published by Pan. 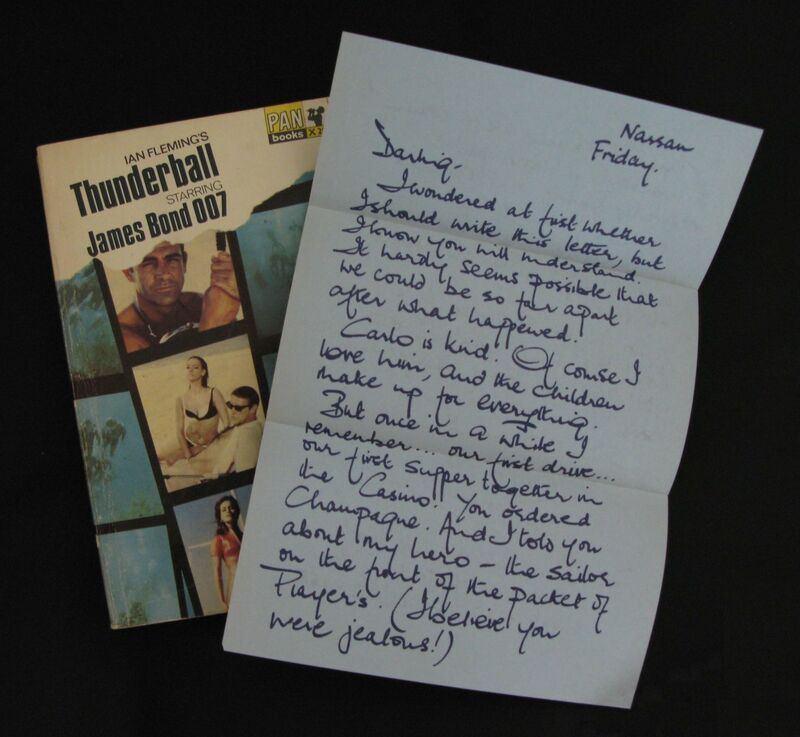 7) “Thunderball” (X201 – 14th printing) movie tie-in published by Pan Books in 1965 containing the blue Players Cigarettes letter written by Domino – (artist unknown). Original copies of this letter in good condition are now fetching amazing prices on the web. Beware facsimiles though… always check for that water-mark. 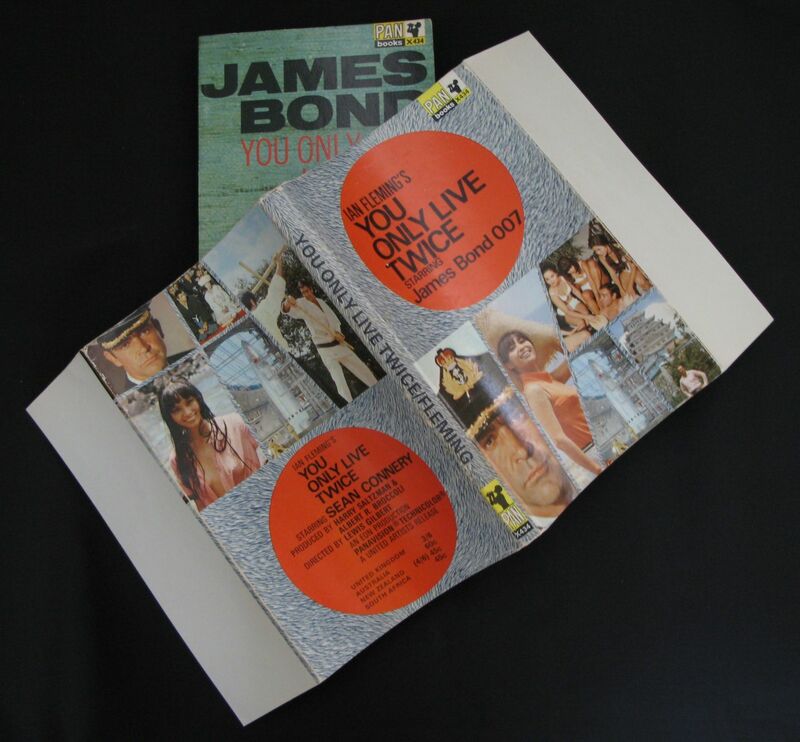 8) “You Only Live Twice” (X434) with movie tie-in dust jacket published by Pan Books in 1967 – (artist unknown). Many years ago I was given a copy of this dust jacket for free and it remained a curio to me for a long time. I’ve since realised they are quite scarce. 9) “From Russia With Love” (X236) movie tie-in published by Pan Books in 1963 – (artist unknown). The idea of having film sprockets down both sides of the front cover is inspired. 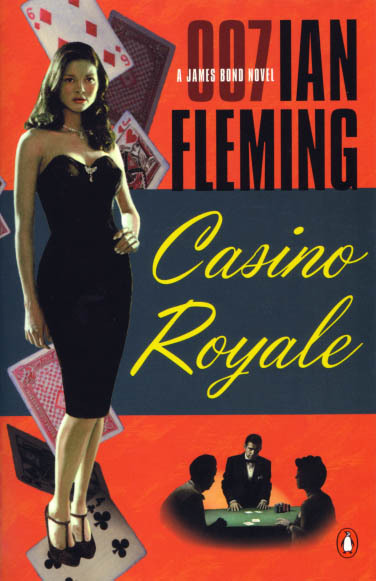 10) “Casino Royale” (ISBN: 9780141028309) published by Penguin Books in 2002 (right) – (artist Richie Fahey). Penguin had tried a few different styles for their Bond covers before Richie Fahey created this brilliant series of covers in the US which were later reprinted in the UK too. While this cover is still relatively easy to find in second-hand book stores, so far I have found 6 different variations of it… and there could be more. 4. What is your favourite paperback cover? That’s a hard call as there are so many paperback covers. I think because I live in Australia I tend to gravitate toward the UK covers since they were the only ones available on the shelves here. I love the Raymond Hawkey inspired “X” Series covers from Pan printed in the 1960s, I really like what I refer to as the “James Bond 007 Series” from Coronet in the 1980s , and finally I really enjoyed the recent Michael Gillette series released by Penguin to celebrate the centenary of Ian Fleming’s birth. However my favourite paperback cover is a bit left of field. 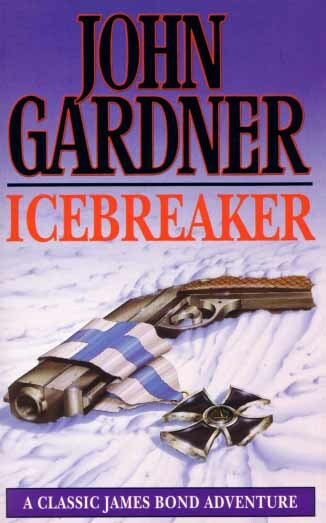 I really like the “Icebreaker” cover (right) featuring a gun on ice published by Coronet in 1992. It just looks really classy, I know very little about this series of books and I wish there had been a whole series of them released. 5. What is on your literary 007 wishlist? Mine is pretty simple, I’d like to see “Colonel Sun” get a paperback reprint. It’s about time. Piz Gloria, the website dedicated to collecting paperback/softback novels featuring the character James Bond 007 created by Ian Fleming. The goal is to display all English language variant paperback covers of Bond novels that are or have been available since “Casino Royale” was first published in 1953. May 3, 2014 in Field Reports.